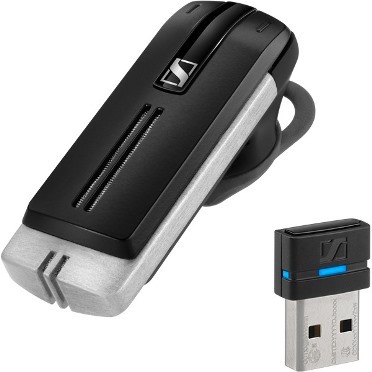 The PRESENCE UC Bluetooth Headset from Sennheiser is a premium headset for mobile unified communication professionals, who require consistently optimal HD sound and HD voice clarity around the office, in the car, and outdoors. 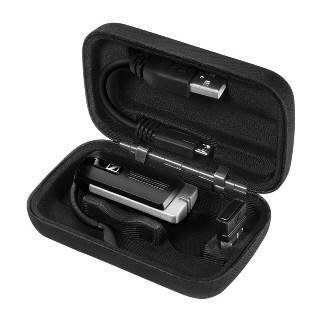 It is also the current best Bluetooth microphone we have found for use with DMPE and NaturallySpeaking. This is the only Bluetooth microphone we fully endorse for Dragon use. You have hundreds of excellent Bluetooth microphone choices for cell phone use but speech recognition has much higher demands. Until recently, only the VXi VoxStar UC Bluetooth microphone met our requirements but because of the long boom, the VoxStar is not very popular among cell phone users. 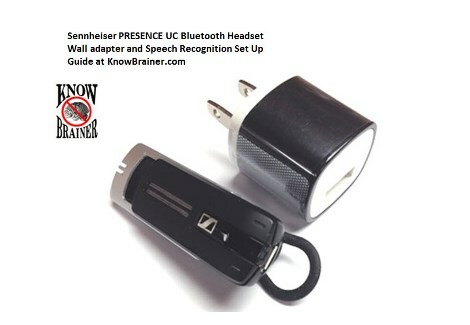 The Sennheiser Presence UC changes that perception. 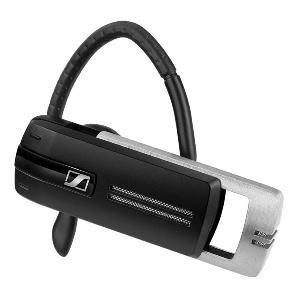 The Sennheiser Presence UC is the only non-extended boom Bluetooth microphone we have found to deliver 99% accuracy in NaturallySpeaking. If you are looking for the perfect low-profile combination cell phone/speech recognition Bluetooth microphone this is it. However, if you are working in a noisy environment, the VoxStar UC would be a better choice. The PRESENCE UC Bluetooth Headset from Sennheiser is a premium headset for mobile unified communication professionals, who require consistently optimal HD sound and HD voice clarity around the office, in the car, and outdoors. 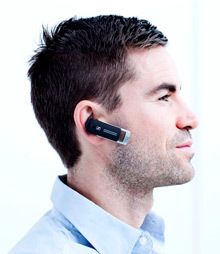 The PRESENCE headset features real-time battery monitoring via the iPhone battery meter. 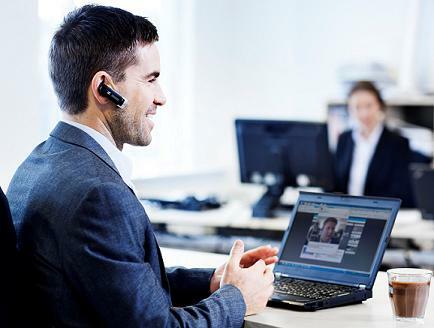 It is compatible with all leading Unified Communication platforms and is designed for multi-connectivity, allowing users to switch seamlessly between softphone and mobile calls, while enjoying the freedom of mobile wireless connectivity. PRESENCE is compatible with Bluetooth version 4.0 wireless technology and hands-free profile 1.6. It automatically adapts to environmental differences to provide you with HD sound while reproducing your voice clearly for listeners, so you can concentrate solely on what's being said. PRESENCE delivers up to 10 hours call time between charges and freedom to move up to 82' from the source device, depending on device and surrounding environment. SpeakFocus technology focuses on your voice to deliver crystal-clear sound, making it easy for listeners to hear what you're saying, even in noisy environments. "Not that good but it is working"
Review Description: I give it three stars because of the lack in audio signal, I have it set on far field BestMatch V but still it doesn't pick up my voice in the way other headsets do. I don't know if it's just me or if it's the headset that is broke. I have updated the firmware with Sennheiser's program both the headset and a USB dongle unfortunately it didn't do anything. "Only works with US English"
Review Description: WARNING: Australian, UK, NZ customers shouldn't buy this microphone if they plan to use it with Dragon. It will not work properly. It requires the user profile to be set up with the Far Field BestMatch V algorithm which is only available for US English speakers. Without the Far Field algorithm, this headset is woefully inaccurate to such a degree as to render it useless. Description: WARNING: Australian, UK, NZ customers shouldn't buy this microphone if they plan to use it with Dragon. It will not work properly. It requires the user profile to be set up with the Far Field BestMatch V algorithm which is only available for US English speakers. Without the Far Field algorithm, this headset is woefully inaccurate to such a degree as to render it useless.